"When I was a little kid, I thought a red-letter day was when you got a red letter in the mailbox. Pretty dumb, huh? It finally dawned on me that a red-letter day is when something terrific and wonderful happens to you. Usually something unexpected. Now that I'm older and more experienced, I know there are black-letter days as well as red-letter ones. Those BIGGEES, the real blockbusters that mess up your life, aren't marked on a calendar either. You never know ahead of time when you're getting one of those...It's those black surprises that get to you, those things people call acts of God because they have to blame someone." I made this quilt to acknowledge a black-letter day. I could feel the annual gloom descending a few weeks ago, and then I saw this meme on my Facebook feed. For some reason, it spoke to me. Maybe it was the birds I had just experimented with in The Lovely Woods. Maybe time had given me more perspective and healing. Maybe I was just tired of gutting my way through February when there are so many happy things to experience. 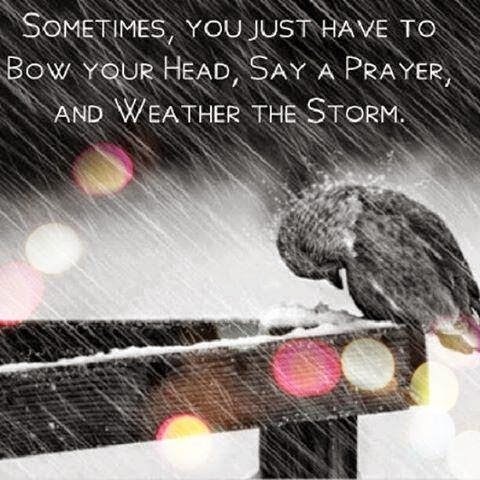 This year I decided that it was time to be brave--to lift my head up and acknowledge it. 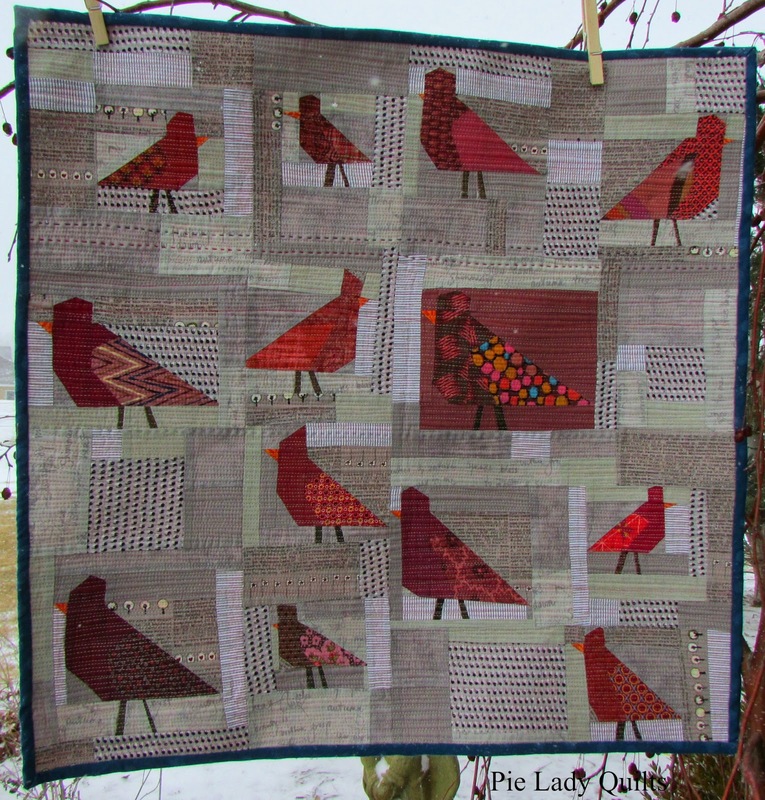 The little birds in this quilt are free-pieced. I had a lot of time to think about things and process my experience while I put the birds together. 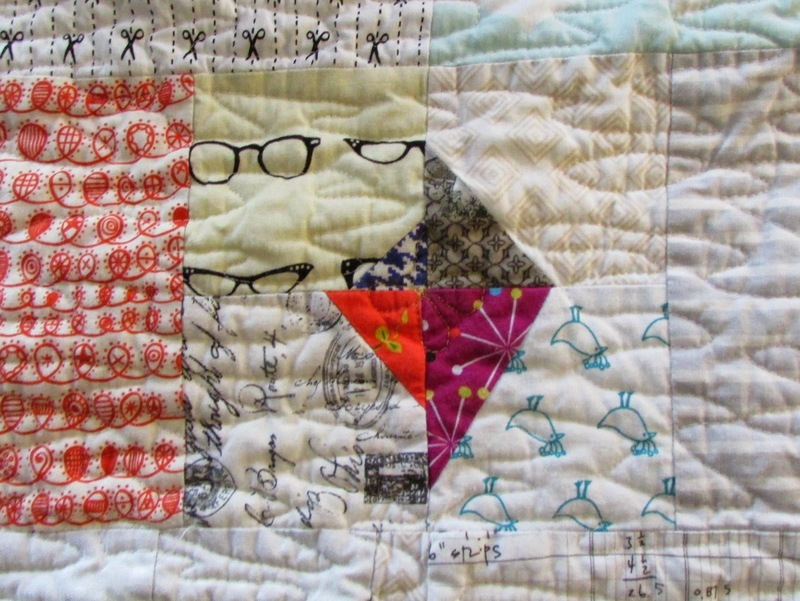 Improvisational piecing really connects you to your quilt because so much of YOU ends up in there. When I looked at this finished quilt top, I smiled. I also had a teary moment. Why? Because it doesn't feel sad. I used my favorite neutral (Cotton Couture, stone) to select fabrics for the background. I love it because the color is not quite gray, and not quite tan. Plus, it makes Marsala look good. I got lucky at my local quilt shop and found quite a few friends that coordinated with stone. 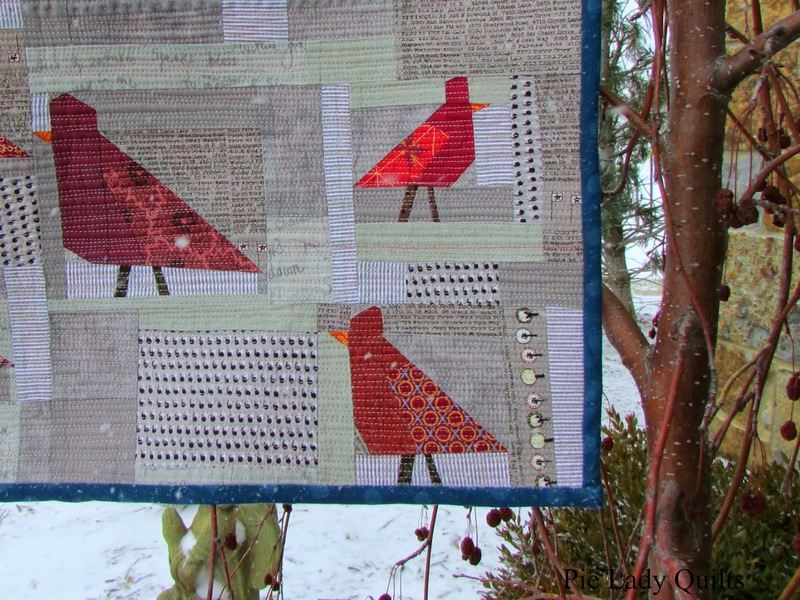 The birds are made out of fabrics from my stash and from a Marsala FQ bundle. My mom found the stack at the brick and mortar location of Suppose, but the Marsala bundle is also found online in their Etsy shop. 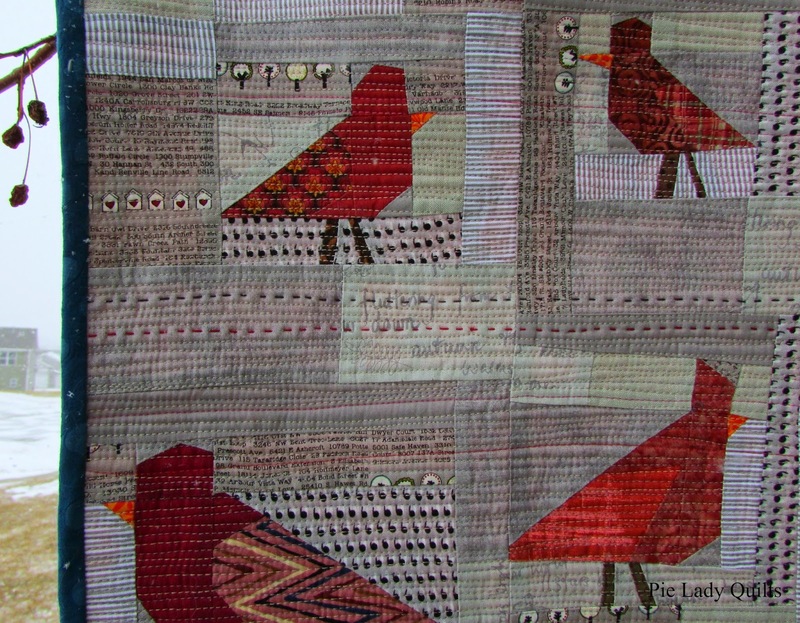 My favorite Marsala fabric is the background of the large bird. It is an interweave chambray and none of my pictures even come close to capturing the depth of the color play in the weave. 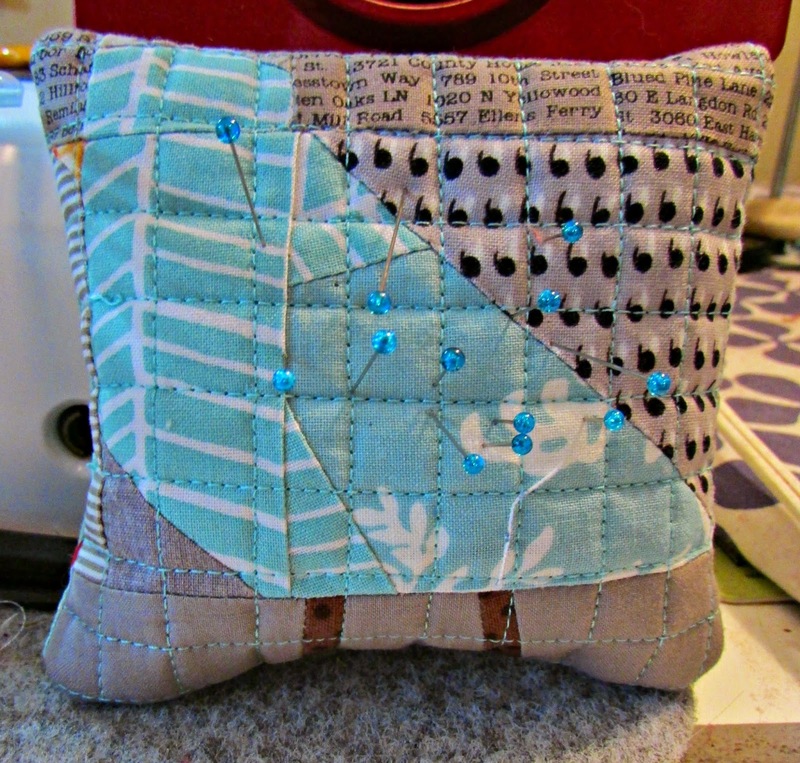 I quilted this with three different weights of Aurifil thread in six different colors. I hand quilted three lines of 12 wt. thread in grey, black and red. 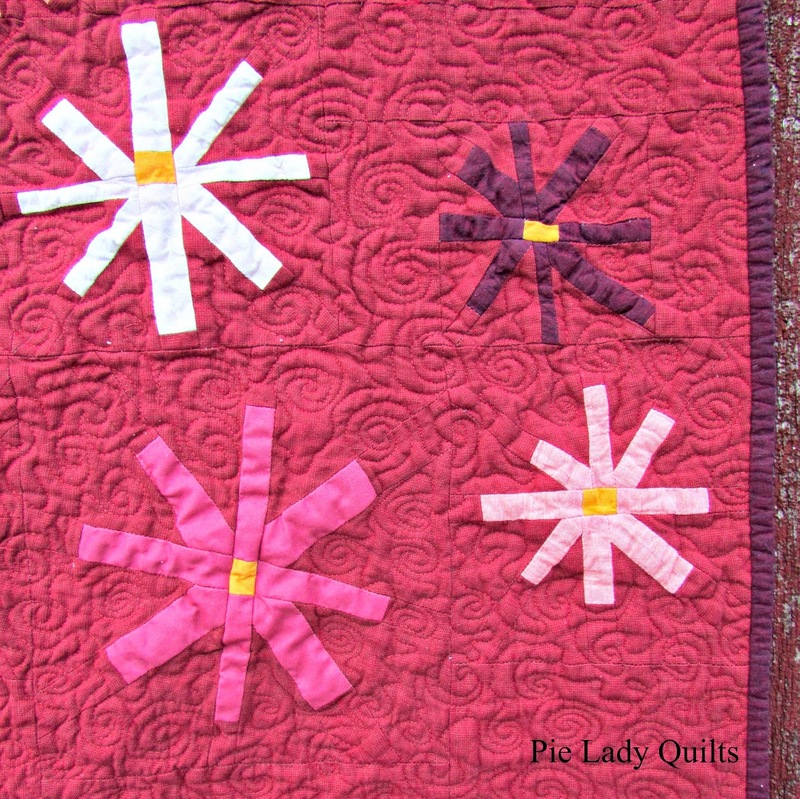 The rest of the matchstick pattern is quilted in a combination of 40 and 50 wt. threads in greys and reds. 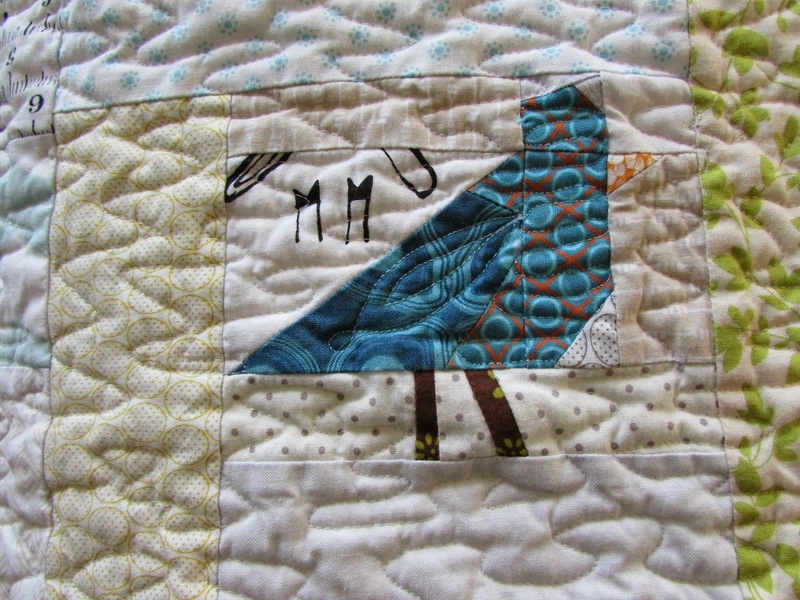 I like the unique texture achieved with matchstick quilting and the special meaning that the thread colors have for me. This quilt finishes at 24" x 24." The tiniest bird is a 3" square. 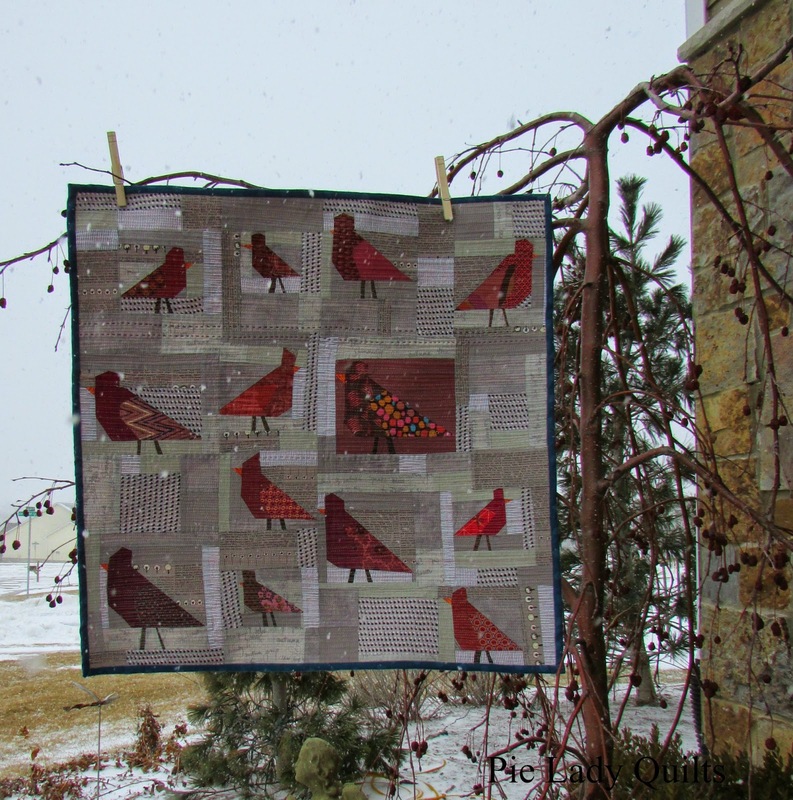 If you are interested in doing a bird quilt of your own, earlier today I published a tutorial for improv birds. This might seem like a strange thing for a history major to say, but my favorite class in college was floral arrangement. That class was just the "doing" break I needed from thinking and studying. The professor would lecture on principles of art, show us pictures of inspirational floral arrangements and then turn us loose to create our own designs. 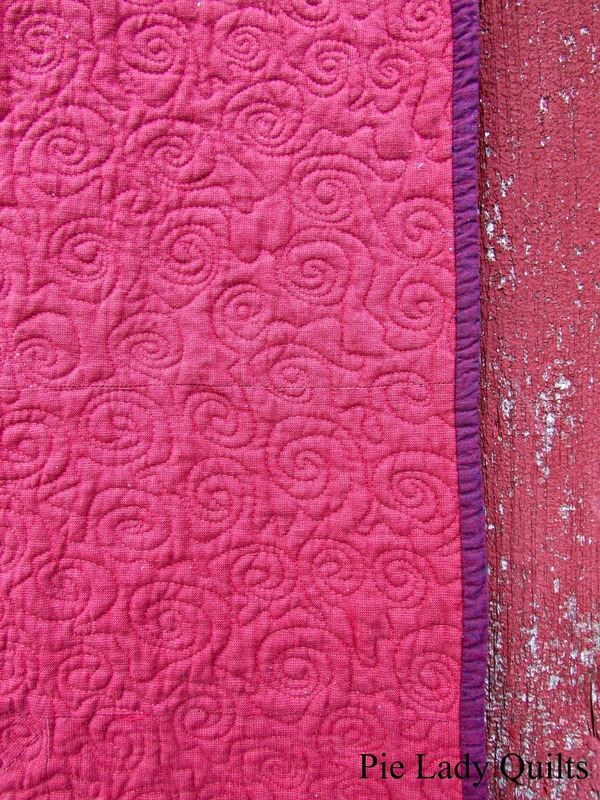 This quilt is based on one of those design principles called the Hogarth Curve. The culmination of this year long course was a difficult project. We were asked to go to the museum on campus, choose a work of art and design a companion floral arrangement for it. After we sketched out a proposal, we could turn in a request for the flowers and the university would purchase them. In the turmoil of the end of the semester, I missed the deadline. I wasn't too nervous about my mistake until I actually went to the museum to choose my inspiration piece. There was a lot of contemporary, black and white stuff that I just wasn't feeling. In another wing of the museum, I found a piece that I really connected with. It was an oil painting by a Mexican-American artist depicting two children playing on a beach. The colors were vibrant and saturated and it was painted with simple lines. The older boy, wearing a fuschia shirt and lapis pants, was standing. His younger brother, wearing a purple shirt and lapis pants was bending over, playing in the sand. To compound my good fortune, a way out of my flower mess appeared on the walk back to the main part of campus. A much appreciated landscape artist had planted masses of fuschia and purple tulips that were just coming into bloom. I came back later with a smile and a Swiss army knife. I pooled my meager resources together and bought two 6-packs of bluish violets, a shallow wicker bowl and some floral medium and drove home to my mom's house to put it all together. My plan was working out brilliantly.....until I ran out of flowers. I was out of money and literally out of time. In frustration and desperation, I walked out onto the porch to clear my head. There I saw the cheerful dandelions peeking out (sorry Mom) from the lawn and ran back in for the knife, the whole time telling myself that the heresy I was about to commit would work because: a.) sand is yellow and b.) the theme of the painting was youthful exuberance. The dandelions would be fine, perfect, in fact. Right. Right?!?! In the end, I discovered that if you prepped a tiny hole in the floral medium, and impaled the dandelion with a toothpick to stabilize it, everything would work out fine. My tall fuschia tulips swirled down to the purple tulips down to the sweet violets and it all ended in a puddle of happy yellow dandelions. I was satisfied and pleased with my creativity.....until I walked into the museum and saw that nearly every one of my classmates had chosen the contemporary black and white pieces. There are several arrangements that I can recall through the horror. The one with 5 dozen red roses, a gilded Phantom of the Opera Mask, rolled up scores of music and artfully arranged feathers comes to mind. As does the arrangement with red birds of paradise that suspended a gracefully turning mobile with origami cranes on thin monofilament wire. I wanted to throw up. I set my arrangement next to the playing boys, silently apologized to them, and walked out of the museum mentally rehearsing how to break it to my mother that I had managed to fail a flower arranging class. Our class was scheduled to meet the next day. I walked in to see a crowd of my classmates excitedly chatting around our teaching assistant. The teaching assistant who was holding a stack of sealed envelopes. Any sense of peace I had come to overnight fled as I waited for her to call my name and seal my fate. When it came, I took my envelope quickly and headed for the door, ready to escape and be done. "Wait," she said, halting my flight. "Aren't you the one who used dandelions?" I turned, and tried very hard to give an attempt at a confident nod, acutely aware all conversation had ceased and that everyone was unabashedly eavesdropping. She smiled. "He liked the whimsy," she said. With shaking hands, I ripped open my envelope just outside the door. A-!!! How I love that man. How much? Enough to remember this lesson 15 years later. Enough to make a quilt that has flowers with dandelion-yellow centers dancing down a Hogarth Curve. It's okay to be different...to do it differently...to see it differently. Although I've had this design in my head for awhile, the colors were chosen with the Pantone Color of the Year Quilt Challenge in mind. If you haven't heard yet, the color this year is Marsala. I would describe Marsala as the love child of raspberry and brown. 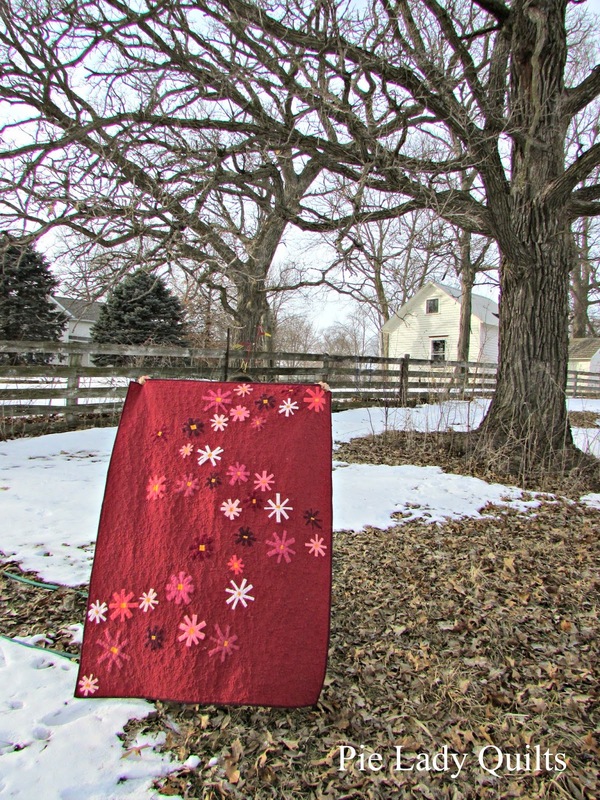 The background fabric for this quilt is one that I picked up at my local quilt shop. It is a Marcus Brothers shot cotton. It felt pretty close to Marsala since the two colors that make up the weave are brown and maroon. For the flowers, I used other shot cottons, a peach chambray and a few solids from my stash. 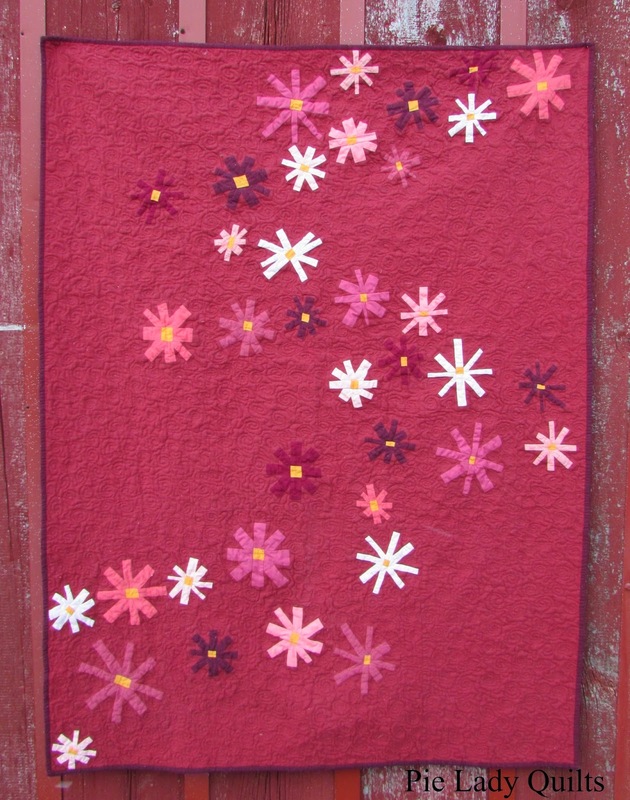 To make the flowers, I read through the free-pieced flower tutorial from House of Krom to help me visualize the process. The flowers I made finish in the range of 4" to 8." Even though it really stinks and feels boring and purposeless, I highly recommend pressing all of the seams open. My Strip Stick was my best friend for this project, and I really patted myself on the back for pressing them open when it came time to quilt it. I quilted this with a 50 wt. Aurifil thread in #2230. I used Leah Day's Wiggle-Wiggle Spiral. I thought the spirals would be fun for the large open spaces and the "wiggle-wiggle" would save me when it came time to go around the flower petals. My children were excellent practice subjects and didn't mind at all when their backs were rubbed in this pattern for a solid week before I started quilting. The quilt finished at 44" x 58." Special thanks to the family who gave me permission to take pictures on their farm. 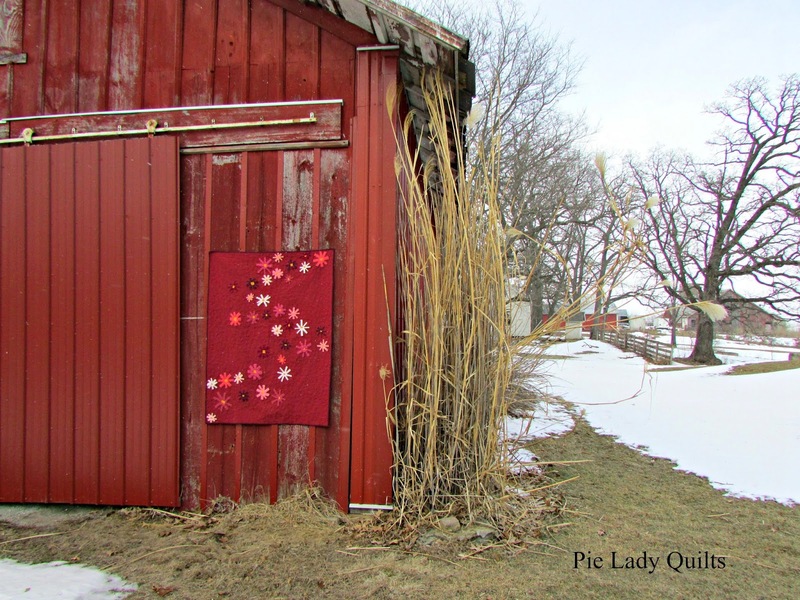 I am glad that I live within walking distance (I didn't walk though...WAY too cold) of an Iowa farm and gladder still for the Iowa people who give you permission to wander around with a camera and quilt and don't think you are the tiniest bit strange for asking. I am participating in a blogger spotlight coming up and was asked the question, "Why did you start your blog?" It's a difficult question, but I guess the most honest answer would be because I feel like I have more to say. 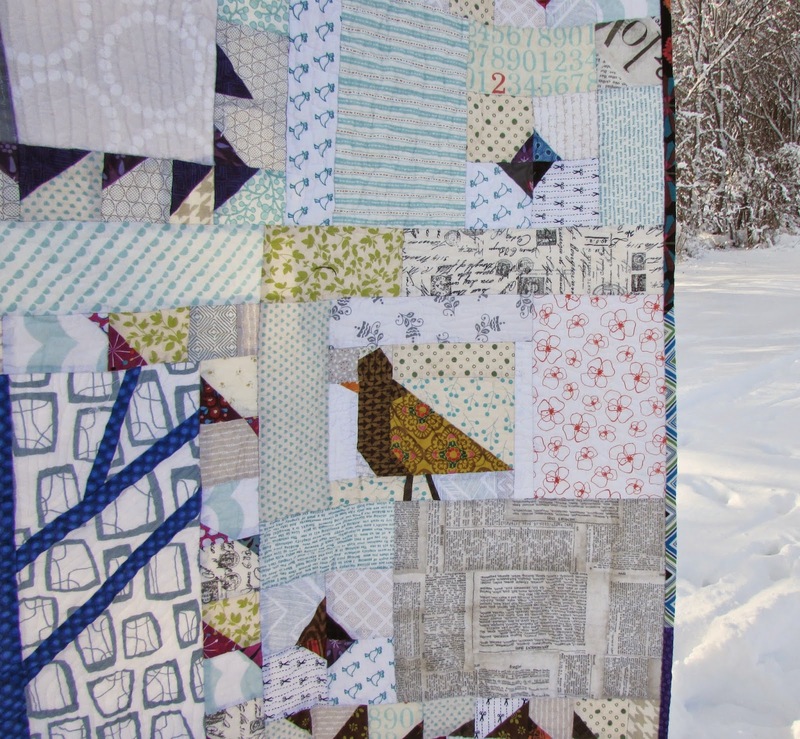 Posting a picture of a quilt on a platform like Flickr or Instagram is part of it, but my blog gives me the chance to tell the rest of the story. 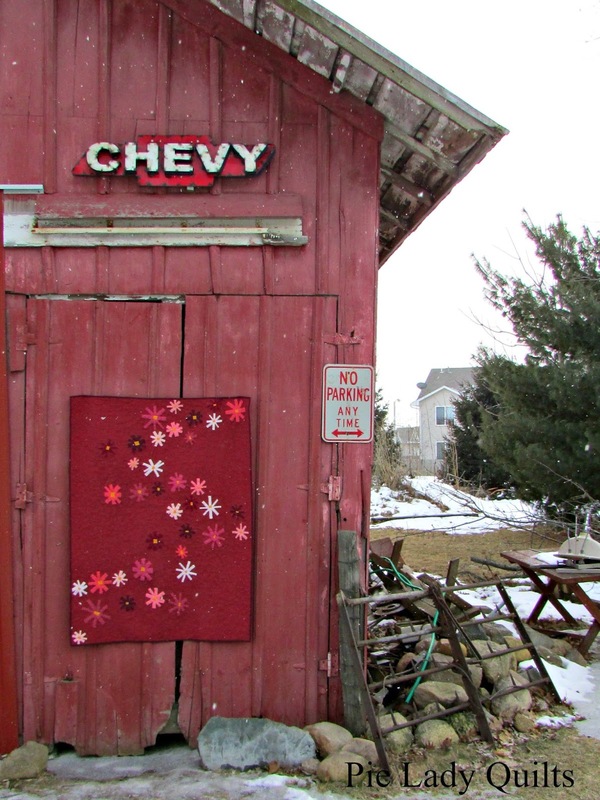 This quilt is a story. Several of them, actually. "One time I saw a red brid [sic]. It was little. It was on top of my house." I smiled when I read it because I remembered that day too. I grew up in Idaho, and there are no cardinals there. Now that I am around them daily, I listen for their song and look for them everywhere. I guess my kids have picked up on my feelings and now they get pretty excited to see a cardinal too. One summer evening we started out on our nightly walk. Before we even got to the edge of our property, we heard the song and froze. High above our heads, at the very top of our house was a beautiful male cardinal singing his heart out. We sat quietly on the sidewalk and listened to the concert. He sang to us for at least a minute before he flew away. I am so glad that we stopped and listened. I am so happy that my son remembered and wrote about it. Happy enough that I put a pair of them in this quilt. We aren't the only ones in our neighborhood that go for a walk regularly. One of my favorite walker teams is a man and his beautifully mannered golden retriever. Like clockwork, they came for their morning stroll around 9:15. Like clockwork, I would either be feeding my littlest her breakfast, or cleaning up and starting on some dinner preparations. Without fail, I would stop what I was doing for a moment and smile at them from the kitchen window. It was clear that they were devoted to each other and I loved how they moved together...a peaceful amble side by side. I heard the ambulance siren when I was dropping off my oldest at school. It sounded close, but I had no idea how close. Without much warning or interruption to the daily schedule, he had died in his sleep. I have been sadder than I can say about this loss. I am so glad that I stopped and smiled at them every day. I hope that he felt those smiles and that the warm thoughts of this stranger help carry him to his next place. Even without putting an actual image of a man and a dog on the quilt, they are in this quilt too. 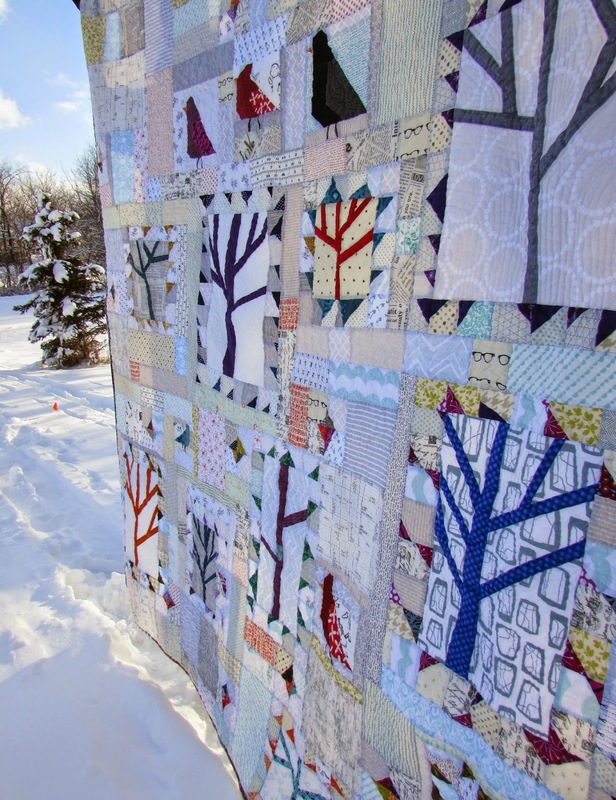 As part of the New Quilt Bloggers Blog Hop I took part in, I also agreed to join in a quilting bee. Each of us took a month to be queen. As the November queen, I got to choose what blocks I had everybody work on for me. I chose improvisational tree blocks on a low volume background. 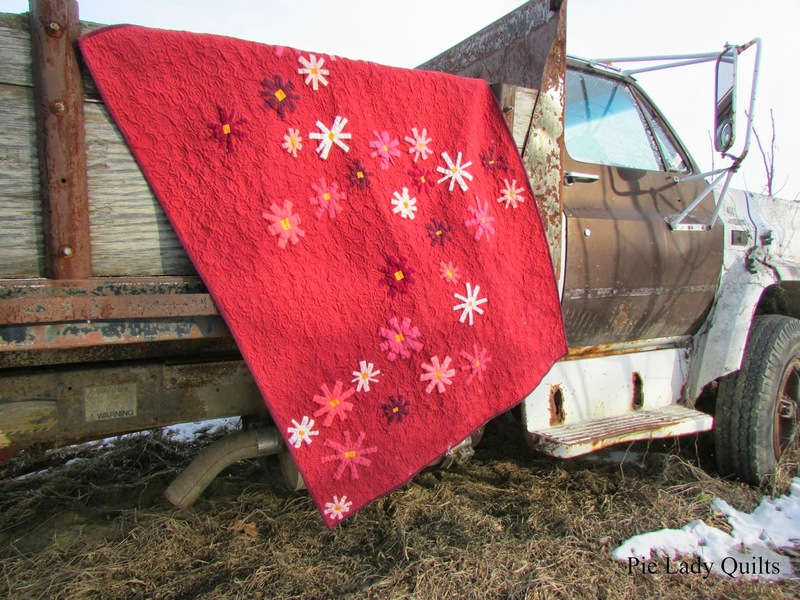 I referred my bee mates to the Free Pieced Tree Tutorial on Pinkadot Quilts. 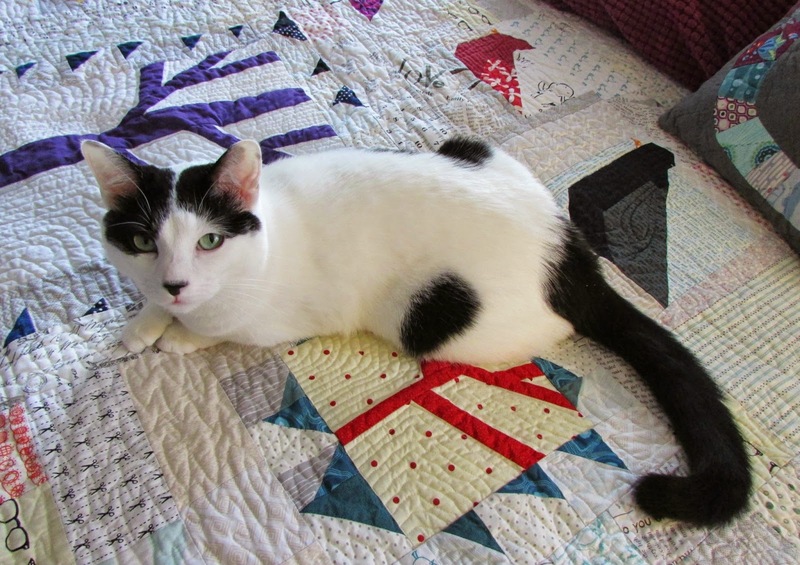 This quilt is made from the blocks that were sent to me by other members of the group. There were many hands that contributed to this forest, and I love the variety. Sometimes when I do improv, I look at my work and think that it is obvious that it was all made by one person who was trying to force some variety into each piece. That is not the case here. Each tree is speaking with a different voice. 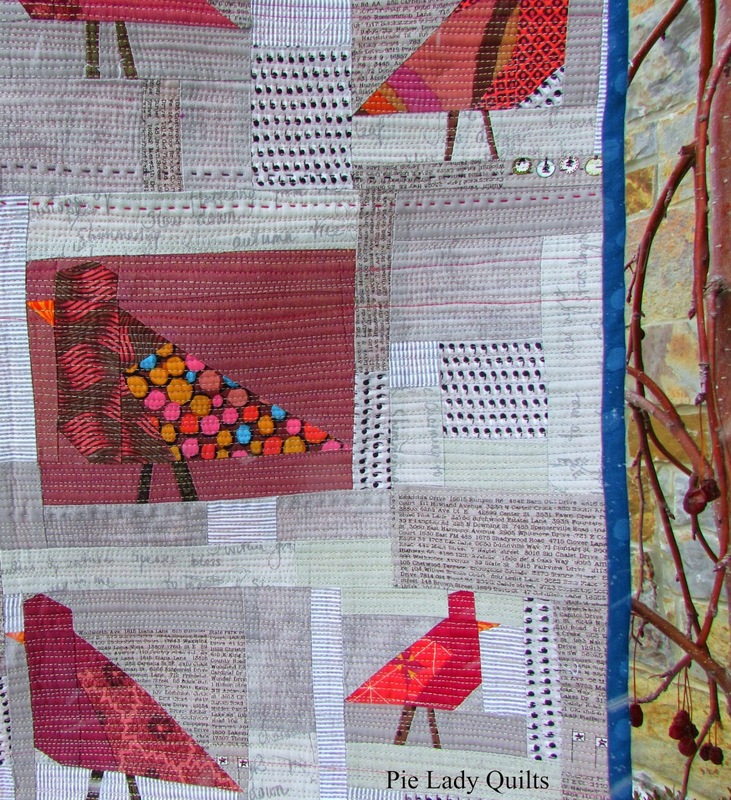 I keep trying different ways to set improvisational quilts. To date, I've tried 3 methods. The first way I tried was to set it in rows, as described in The Flannel Pancake. Next, I tried putting one together in a kind of log cabin method. I started with a center piece, then added slabs of improv to the top, squared it, then to the side, squared it, to the bottom, squared it, then to the last side. I kept going until I had a lap size quilt. 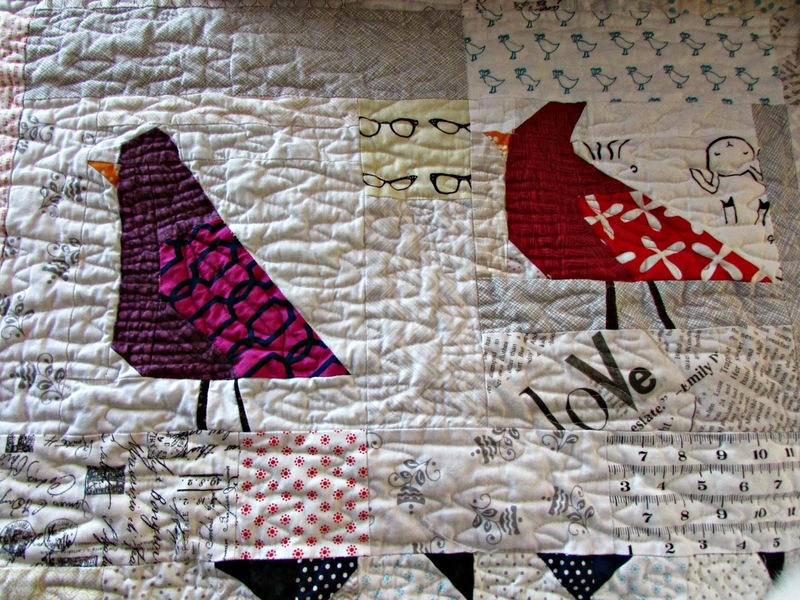 (You will see this one eventually, once I have the hand quilting done.) That way is fun, but as the size grows, it can get unmanageable pretty quickly. 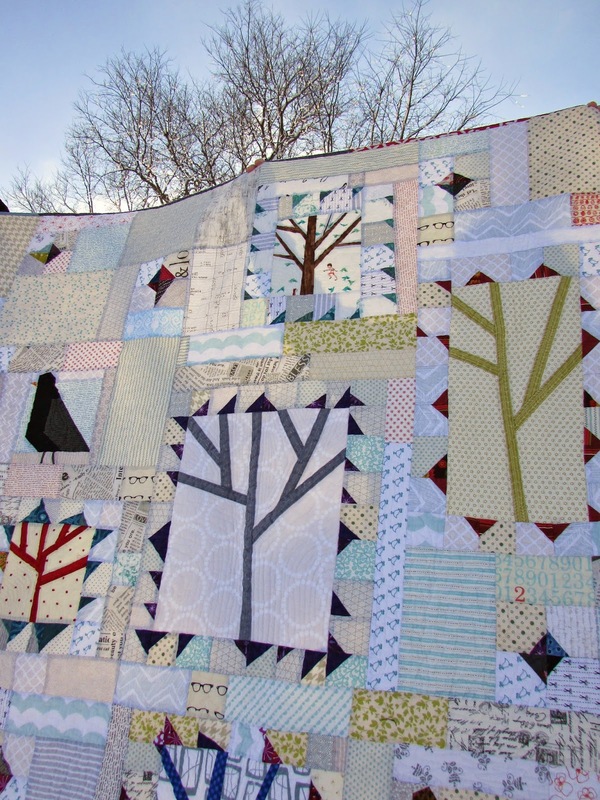 Since I wanted to turn the trees into a queen sized quilt, I knew I needed to think of a different way. For this quilt, I got out my handy graph paper and made myself a map. I drew in where I wanted major design elements to be and budgeted a space for them. I set the scale for my grid to be at 3 inches, and then calculated how big different slabs of improvisation needed to be. For instance, in my map, I drew each bird in a 3 x 3 box. Since my scale was set at 3," I knew each bird needed to finish at 9.5" x 9.5" (The extra 0.5" is for seam allowances, I just added that in once I had done the math). If my bird finished a little short, I just sewed some more low volume pieces around it until I had what I needed, then squared it to size. I still could make instant decisions about fabric and placement, I just gave myself space constraints so I wouldn't need the world's longest ruler and the world's biggest cutting mat to have a square quilt. This quilt top is entirely from my stash and scrap bins. For a couple of years now I have been faithfully saving my tiny triangle snippets from bindings, paper piecing and flying geese. I wish I could tell you that I used them all. Sadly, I did not even come close. The bucket's fabric level doesn't even to appear to have dropped, but that's probably just because I dug around in there and disturbed the flat piles of triangles. Nonetheless, it was very, very, VERY satisfying to use what I have and at the same time be grateful that I had it. Even the binding is made of all the binding scraps I had saved. This quilt finishes at 96" x 96." I used Quilter's Dream Wool for the batting. 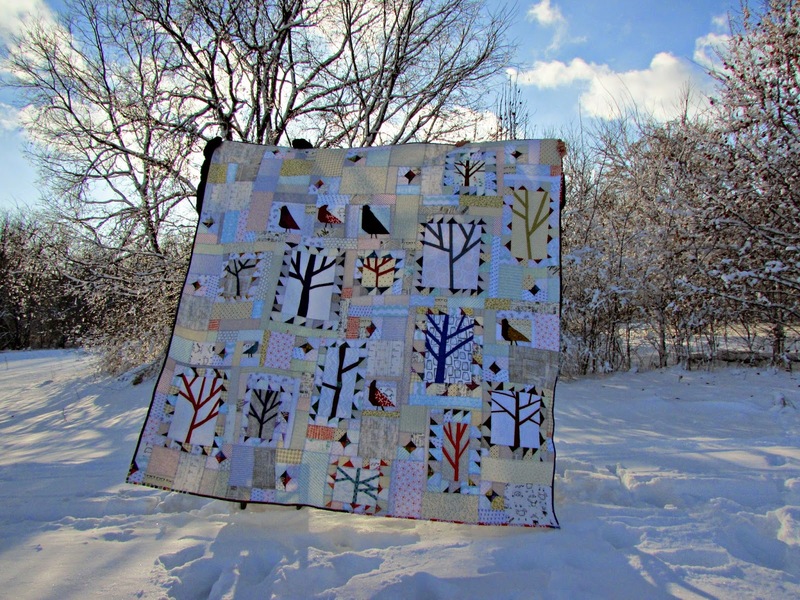 I quilted it in an elongated meander (I was going for wind in the trees) using 50 wt. Aurifil 2021 on the top and 40 wt. Aurifil 2325 on the back. 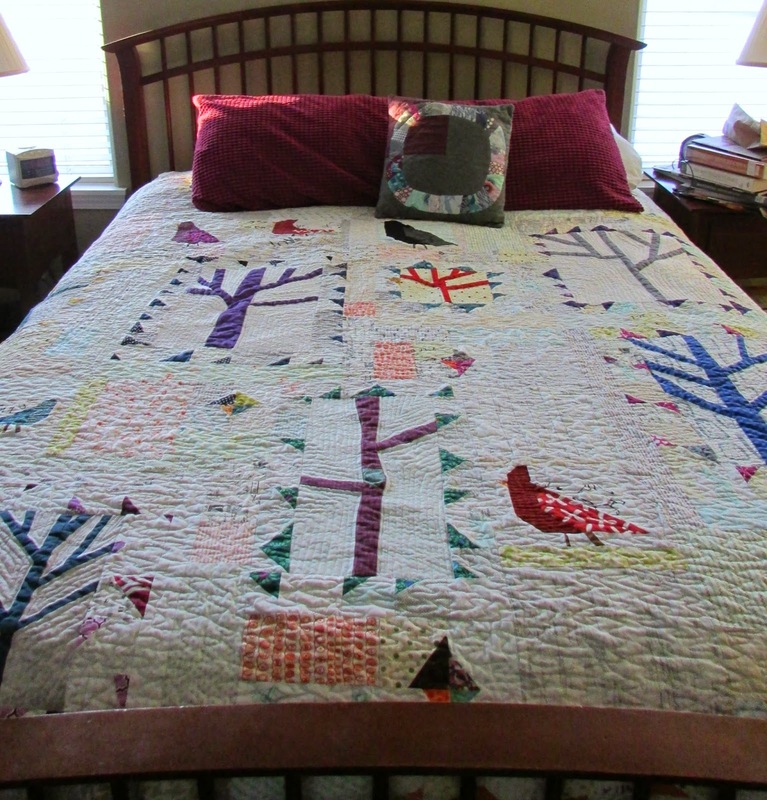 This quilt is already on its new home...my bed! I think it's hilarious that Molly has chosen to lay right next to the birds! Here's to all the little things we can see when we stop and look. Thank you for stopping to look here.